There’s nothing worse than getting out of bed on a cold winter morning. But if the idea of facing a slushy, crowded subway on your way to work makes you want to throw the covers back over your head, it may be time to consider a new mode of transportation. Winter cycling can be intimidating, especially in a city like Toronto. 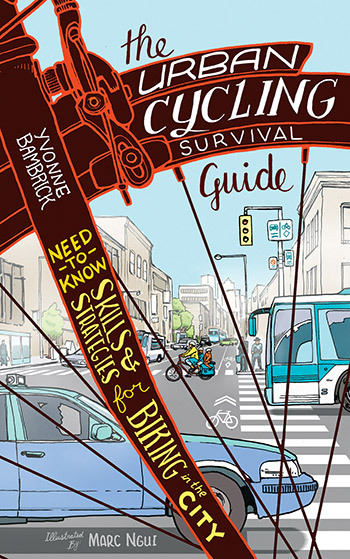 But with a few tips from Cycle Toronto to help you master the art of cycling on snowy streets, you’ll be prepared to take on a new challenge this winter. If you’re planning on becoming a winter cyclist, there’s really no way to avoid biking in sub-zero temperatures. However, you should make yourself aware of ice on this roads; precipitation followed by freezing temperatures may make cycling an unsafe option, so you should always make sure you know if the conditions are cycling-appropriate. Cycling will definitely help keep you warm, but you should make sure that you’re still dressed for cold temperatures. A windproof jacket is essential, and a warmer layer underneath will keep you toasty. You’ll also want to keep your face warm with a breathable scarf. A hat can be tricky to fit under a helmet, so you can also use earmuffs to keep your ears warm. Also, make sure to pack a spare pair of warm socks to take with you. For especially windy days, you may even consider windproof pants and ski goggles. Whether you have a specific bike you use for winter cycling, or you use the same bike year-round, it’s important to make sure that you’re taking care of it. If you can’t store your bike in a shed or garage overnight, make sure to throw a tarp over it. You’ll also want to wipe down your bike every now and then to get the snow and water off. Some cyclists used spiked tires for extra grip, but they aren’t absolutely necessary for Toronto winters. With a little bit of preparation, you’ll be able to stay safe and warm while cycling during the winter months. If you’re ready to take your bike to the street, join Cycle Toronto today, February 2 at their annual Coldest Day of the Year Ride. We hope to see you there! Can we make Toronto safer for cyclists?